1.) Use Windows XP SP3 – SP3 (Service Pack 3) includes the latest speed patches as well as important security patches for your Windows XP. For example for Firewire and USB drivers, things are optimal when run at Windows SP3. 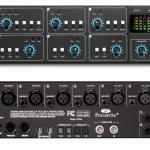 In addition, most Firewire and USB audio interface drivers are optimized and designed to run at Windows XP SP3. You can confirm that in the manual or in the manufacturer website. This implies that if you are still using either SP1 or SP2 (older service packs), then do not expect everything to run at their optimal condition particularly the drivers for your Firewire and USB audio interface. 2.) Reinstall your OS and upgrade to SP3 – this may sound time consuming but I noticed a BIG increase in my OS performance after reinstalling everything and upgrading to SP3. It won’t take very long; at most it will take a day of upgrade. 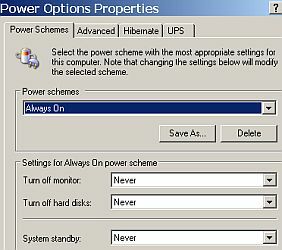 The primary reason is that if your OS has been running in your computer for a very long time (example more than 3 years); there are big chances that the registry as well as the affected legacy drivers are corrupted or altered. This can slow down your computer when you are recording or mixing. If you reinstall it again, all those corrupt registry entries and drivers will be erased and things will go back to normal again. Of course, you need to back up your computer files before doing this. 2.) Change “Processor Scheduling” to “Background Services” – when you are recording, the digital streams of data coming in and out of your Firewire/USB audio interface comprises the background services of Windows XP. 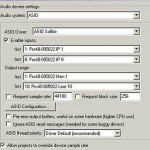 Specifically these modern audio interfaces depend on ASIO (Audio Stream Input/Output) drivers and they are assigned to operate in the background. 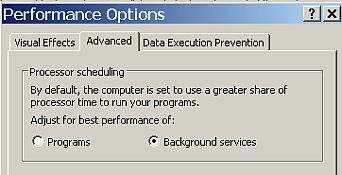 If you change processor scheduling to background services – the CPU will optimize and put importance on the background tasks. 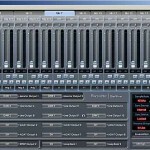 This will reduce latency and delay of your recording since the CPU will put more priorities to it. 3.) Use Panda Cloud Anti-virus – some Windows XP optimization guides for audio are advising not to use antivirus. I am not in favor of it. Why? It is because Windows XP can easily be infected with viruses, spyware and malware and a lot of computers used for home studio are also used in surfing online and plugging/unplugging USB drives which can be easily infected with a virus. The best solution is to use the lightest antivirus possible and I recommend Panda Cloud Antivirus because it is very light on system resources and it’s free. However when recording to get the best performance, I recommend turning off your Antivirus updates and real time scanning.